We used to get this question a lot, “Do I really save energy by letting my house cool off when I’m at work, since the heating system has to work so hard to warm the house back up later?” Vermonters are frugal and it’s common to use a temperature “setback”: allowing the house to be cooler than is comfortable when no one is home, or when everyone is asleep. But, there is skepticism that it doesn’t actually save energy since warming the house back up (surely) uses so much energy. My stock answer to this question is, Yes. Courtesy of my colleague, Paul Scheckel, an analogy: When you want to make tea, do you keep the kettle hot all day, only to pour your orange pekoe at 4pm? No, you turn the kettle on when you want the water hot. The moral: there is no need to keep your house warm all the time if you’re only going to enjoy that warmth for a few hours in the morning and a few at night. Caution, I’m going to contradict this later on: DON’T TAKE MY WORDS OUT OF CONTEXT. Sometimes my questioner shoots back, “But my house doesn’t ever get down to 62 (or whatever the setback temperature is) degrees.” The purpose of the setback isn’t to make the house colder, it’s to prevent the thermostat turning on the heating system (as frequently) during the setback period. But why didn’t the house cool off? Because it’s insulated. Teakettles aren’t insulated. The better insulated and air sealed a house is, the more slowly it cools off. Very air tight and well-insulated homes cool off so slowly that they only call for heat infrequently, whether or not the house is in setback. Efficient homes save less from thermostat setback than poorly-insulated and leaky homes. Older, poorly-insulated homes can save quite a bit of energy by using thermostat setbacks, and that’s probably why this strategy has taken hold in the Vermont imagination as a way to be frugal. The reason heating the house back up after setback doesn’t incur an energy penalty is that most heating systems operate at the same efficiency no matter how much heating they have to do. In fact some heating systems, particularly oil -burners, are a little more efficient when they run for a long time, as they would when warming the house back up. Now comes a new type of heating system – the cold climate air source heat pump. (Also occasionally known as: ductless heat pump, mini-split, heat pump, air source heat pump…) The defining feature of a cold climate heat pump is that it’s variable speed; it doesn’t operate only in on-mode or off-mode, it can put out a little bit of heat or a lot of heat. Cold climate air source heat pumps are most efficient when they are not working very hard: very much like a car rolling along at a constant speed. Also unique to cold climate heat pumps is that they make less heat as the temperature outside drops. So, if you combine the lower efficiency and lower output at low temperature you can see that you don’t want to ask your heat pump to do a lot of hard work when it’s very cold outside. So how should one operate a house heated with a cold climate heat pump? Do not set the temperature back, ever. By keeping the house at the same temperature it’s like driving a car at a constant speed on a flat road: you only have to put a little energy in to keep going. On the other hand, recovering from a setback period (changing the temperature of the house) is like accelerating a car uphill: you’re asking the car to work hard, it does so less efficiently AND your car has less power the steeper the hill is. The car won’t be able to do what you’re asking , and it will use a lot of gas trying. Or, to shed the analogy, your house won’t recover from the setback very quickly, and it will do so at the lowest efficiency. So don’t accelerate and don’t drive uphill. What about the teakettle? Isn’t it wasteful to keep the house toasty warm when no one is home? Remember, well-insulated and air-sealed homes don’t gain much from letting the house cool off. In fact, given the unique nature of a cold climate heat pump it might actually make the most sense to heat the house up when no one is home. If the warmest part of the day is at 1pm, when everyone is at school or the office, it might be best to ask your heat pump to get the house extra warm at that time, when it can do so at a higher efficiency, rather than expecting the heat pump to do a lot of heating work at 5:00 when everyone is home but the temperature has dropped 10 or 20 degrees. But ONLY if the house is well-insulated and air-sealed so it can hold onto that heat energy long enough that you get to enjoy it later. This is how a well-insulated house is like a battery. You can fill it up with heat energy at the best time, and use the heat energy later when you want to be comfortable at home. It only works if your house can hold the heat, and it’s only beneficial if you’re using a cold climate heat pump. Make a compelling case for why one operates a heat pump-heated home differently from a fuel-heated home. Make improvements to the insulation and air tightness of your home! Another Window Option – Local in Vermont! In April I wrote about the Advanced Energy Panel, on sale through August. These interior storms can make a decent primary window perform close to the best window money can buy, all without construction mess or cost. Indows are ordered with a brown, black or white weatherstrip around the frame. You slide the whole thing into the window opening; the compression of the weatherstrip holds the Indow in place. Clean look! Now a Vermont company has become a dealer/manufacturer for another interior storm window: The Indow. These storm windows are a single pane of acrylic fitted with a weatherstrip around the frame. 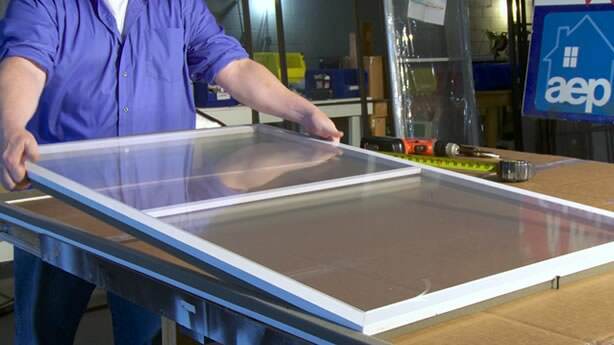 Compared to the Advanced Energy Panel (also known as WindowTherm), it’s easier to fit the Indow to your existing window opening because there are no fasteners involved. they do not complicate the exterior look of classy old windows, and in the summer they’re not even there! As to price, I can’t compare the two options, but you can! With the AEP sale still going on, and the Indow new to Vermont, give the dealers a call and get some costs for your home. The Indow dealer is EnergySmart of Vermont. Ground source heat pumps, also known as geothermal heat pumps, take energy from ground water, and through the miracle of heat pumps, use it to deliver heat to your home. As with all heat pumps, the electricity that goes into the system is used to move heat from one place to another, and you can move two- to four-times more energy through a heat pump than is contained in the electricity itself. For that reason, heat pumps of all kinds are more than 100% efficient. Ground source heat pumps (GSHP’s) need a few other components to make a system that can heat your house: the “ground” part, which is usually a well, but can be a bore hole, pipes laid out horizontally underground, or a pond; the pump or circulator to get the water to the heat pump; a distribution system in the house to move the heat around; and the pump or blower that pushes the heat through pipes or ducts. The whole heating system is a lot more than the heat pump itself. As an electric heat system, a GSHP can be a good match for a zero energy home. 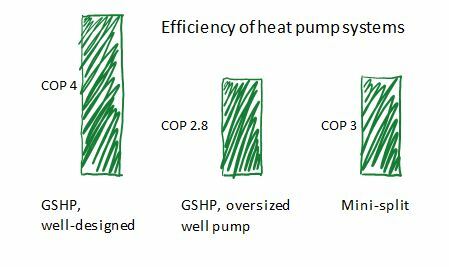 However, the cost for a GSHP system can quickly balloon, and with poor design a GSHP system can have disappointingly low performance (low heat output and higher than expected electricity consumption). Within our Zero Energy Home pilot we’re looking for the path that is more economical than buying energy, so we need both a low cost heat solution and great efficiency if the zero energy home proposition will prevail. Can a GSHP do it? Before we get to that, there are a few other things to consider. 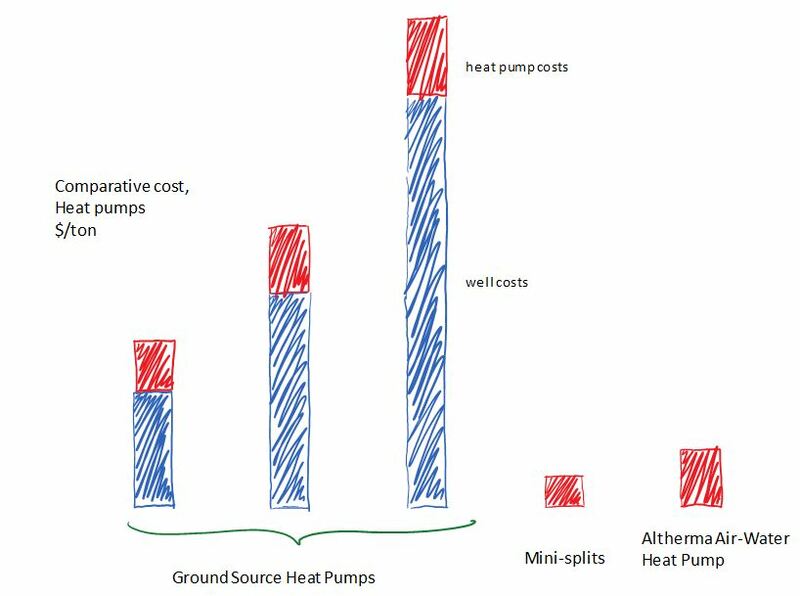 Why a GSHP instead of mini-split heat pumps? The great advantage of a GSHP is that it gets hooked up to a distribution system that delivers heat all over the house. If your house is too big, or does not have an open plan, or you can’t improve the insulation enough, moving heat around is required. A distributed heat system can provide comfort in homes where mini splits won’t work. Furthermore, the well (or other ground-coupling system) is very site-specific. The biggest cost unknown with a GSHP system is the well. Some sites will not have an economical ground energy resource. Finally, your home’s existing heat distribution system is not designed for the lower temperatures that a GSHP generates. Because a zero energy home package includes a greatly improved building enclosure, it’s possible that a distribution system designed for 140 degree air could keep the house comfortable when delivering 80 degree air, but that’s something that needs careful review and it underscores the importance of getting the building enclosure right, even if you’re buying an awesome heating system. So, can a GSHP heat a zero energy home economically? There are two budgets to consider: the financial budget and the energy budget. On the financial side, the cost of a GSHP can vary widely, and as with all heating systems, the lower you can drive your energy demands, the less expense there will be in the hardware. Maybe a GSHP can heat a zero energy home economically: it depends. GSHP’s use a well to pull heat out of the earth. Well cost can vary a lot, and adds cost to the heating system. Air source heat pumps, represented by the two bars on the right, have a compressor outside, but no expensive ground-coupling. For the energy budget, the GSHP’s have great performance and high efficiency. For each energy unit of electricity used, a GSHP can deliver 4 energy units to the house, and unlike the air source heat pumps (mini-splits), a GSHP does not lose heating capacity when it’s cold out. But a GSHP’s ability to perform at this high level is very sensitive to good design and installation. Maybe a GSHP can heat your home within your energy budget if your ducts or pipes are suitable and if the system design is ideal: it depends. While more expensive than other zero-energy-ready heating systems, GSHP’s also deliver with good performance and high efficiency. But poor system design can hurt efficiency, so work through Water Energy Distributors to make sure your system will be designed right. Your existing heat distribution system cannot deliver enough heat with low temperature water or air. If you want to pursue a GSHP, I recommend working through Water Energy Distributors. They do all the design work at the distributor, and have a network of contractors who are trained and supported by engineers. Don’t fall prey to the idea that a GSHP is a miracle device that will solve all your problems. A GSHP system requires good design. Otherwise you’re just spending a lot of money on something that will perform little better than electric resistance heat. For an overview of the whole zero energy home concept, here are two public presentations that were recorded. Necessarily I don’t dig deep into any of these topics: its just an overview. I haven’t watched the whole thing so I can’t say how watchable it is. If the high def version linked above isn’t working for your download speed, here’s a lower definition version. This presentation is one in the 6-month series we did in Montpelier. Each of the Montpelier presentations looked at one aspect of a zero energy project, and this presentation was on Heating the Zero Energy Home (one of the better presentations in the series!) We do manage to dig a little deeper into this topic than was possible with the all-in-one presentation above, yet we still just introduce most of the issues. Disclaimer: these presentations come from my point of view. There is a lot of healthy debate over what exactly zero energy means and what we all should be doing with our buildings. But that debate is not in evidence in any of these presentations. This is my version of zero energy: existing homes; least cost path. Others can represent opposing views. For me, I spend my time promoting something I believe in: housing for the rest of us. This Thursday Net Zero Montpelier presents the last in a 6 month series on Zero Energy Homes. The Affordable Zero Energy Home applies financial concepts to the big-ticket energy projects that make up a ZEH. Can you get positive cash flow with a zero energy project? Is the return on a zero energy project better or worse than your retirement plan? than the stock market broadly? Do ZEH’s “pay for themselves”? Do you get your zero energy money back if you sell the house? Come hear Li Ling Young and Mark Kelley, of Efficiency Vermont, shine a financial light on zero energy. Montpelier UU Church, April 9 6:30 – 8:30. April’s theme seems to be, Get It While It’s On Sale. Yesterday it was insulating window panels. Today it’s a ventilation system that might be perfect for retrofitting into an existing home. Effective ventilation is a necessity in all homes. I’ll ignore the fact that most homes don’t have anything like that, and just point out that you have to plan for a ventilation system when you undertake your zero energy project. The best ventilation systems: ones that supply fresh air to the right places, while extracting stale air out of some other right places, usually involve ductwork to move air around the house. In an existing home installing ductwork is either destructive and messy, or just impossible. These ducted ventilation systems are referred to as HRV’s (heat recovery ventilators; or ERV’s: energy recovery ventilators). A very unique ventilation system does the same thing as an HRV, but without the ductwork. Billed as a decentralised ventilation system, the Lunos e2 puts a small fan in each of several holes around the house, and coordinates these fans to work in tandem, supplying and extracting air alternately. Each fan has a ceramic core that stores energy from exiting air, and later puts that energy back into the supply air when the fan reverses. With very low energy use and very high heat recovery the Lunos rings all my bells. You still have to run low voltage wire to the DC fans, but compared to installing ductwork all over the house, the Lunos e2 is a dream to install. And the sale… Well, the price has come down a few hundred bucks. Not sure if that’s a sale or a plain old price reduction. Spendy as they are, the price break makes the Lunos e2 a more realistic option for the affordable Zero Energy Home. The Advanced Energy Panel is an interior storm window that goes up for the winter and is stored for the rest of the year. Two layers of very tough, lightweight plastic film make an insulating pocket of air. Here’s an answer to the problem, if not a complete or entirely cost effective one. One of my favorite non-replacement options is on sale – 25% off – in April. Advanced Energy Panels (AEP) is headquartered in upstate New York. 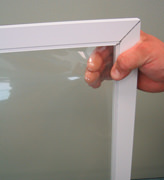 The product is an interior storm window with two layers of plastic film glazing. The aluminum frame fits inside the window jam, from the inside, and seals with weatherstripping. Two layers of plastic film makes an insulating pocket of air, and the space between the primary window and the storm window is another pocket of air. There are a couple of disadvantages to the interior storm approach. One, it does nothing to protect the primary window from the weather, and if you have old, beautiful windows that may be a priority. Two, you have to install, remove and store the storms – a big deal if you don’t have a basement or garage. And, three, you can’t open the windows without removing the storms: only an issue in the winter. The Advanced Energy Panel is manufactured to fit your window and has a compressible gasket that seals the space between the primary window and the AEP. But the advantages: many! Interior storms, especially ones that seal well, do a great job controlling window condensation, and for many windows that is a big help in preserving the window and trim. The multiple layers of glazing really do a lot to improve the heat-retention of the windows, maybe even more than the most expensive new window on the market. And, finally, at 25% off, the AEP is probably the least expensive way to get to those higher levels of performance. One caution about the AEP; there’s a little bit of carpentry involved in fitting your window opening for the storm panel. There may be a compromise to the aesthetics, but for most windows it can probably be done with a very small change, if any. As with so much in the Zero Energy world, the time is now! If you have good-functioning windows this is probably the best way to make your windows Zero Energy ready. 25% is a discount not to be passed up.